Looking for a tour guide system with an XLR input (e.g. to connect to a mixing board? As a component of the Synexis tour guide system, the TS8 supplies this feature and more. The Beyerdynamic Synexis TS8 augments the Synexis tour guide system with several features that are indispensable, especially in the conference field or for larger events that require simultaneous interpretation. The TS8 extends the coverage radius of our Synexis tour guide systems by an additional 20% and commands many other useful functions. The Synexis TS8 is a 19" rack or desktop system and requires a 220V connection with a fuse of at least 0.5 amp. Used with the Synexis tour guide system's super-sensitive RP8 receiver, the TS8 achieves a coverage radius of 120m and more, corresponding to an area of about 45,000 square metres. As a soundman and front-of-house audio engineer, I consider the XLR input on the rear of the TS8 one of its most useful features; it can be switched from "balanced" to "unbalanced." This allows several racked TS8s to be connected to other devices at the mixer, letting the front-of-house technician control transmission of simultaneous translations. The separate gain control on the front of the TS8 is also useful, enabling powerful, clear transmission. The jack input (6.35mm) and chinch and outputs have also proven convenient. The latter are mainly used to make live recordings of translations. Microphones can be connected to the TS8 via the XLR input; other sound sources (like MP3 players) can connect to the unit via chinch. Like the displays of every component of the Synexis tour guide systems we rent, the TS8's display is nicely sized. The display's OLED technology doesn't use much power, and reading the screen is easy, even in difficult lighting conditions (like direct sunlight). Displays frequency, channel and the current AF-level. 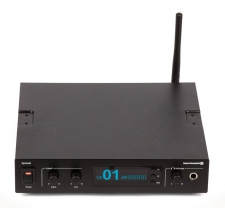 In short, the Beyerdynamic TS8 stationary transmitter augments the Synexis management system, turning it into a comprehensive, modular interpreting system, with excellent reproduction of speech. These ranges are estimates, based on our experience. We've been renting Synexis tour guide systems in the conference sector for years, and we've never had trouble covering conference and convention locations with the TS8. And we're radio professionals, so our inventory includes high-powered antennas and repeaters for our tour guide systems. So if you need to cover very large spaces or a location with difficult architectural issues (steel-reinforced concrete, for example), we'll be glad to provide you with knowledgeable advice, free of charge. A complimentary site visit or on-site test run is also possible. As service providers, we're proud of the support we provide. Want to rent or buy a tour guide Synexis system ? We’ll be glad to prepare a rental (or purchase) quote for a professional Beyerdynamic tour guide system, just for you. Reach us any week day from 9 AM – 6 PM at the toll-free number above, at our office number, +49 30 29381970, by e-mail at mail@Radio-Rental.com or in our offices (->Contact Info).